The humble PDF has become the global standard when it comes to document sharing. In the same way that many people don’t differentiate between Google and the internet, Adobe’s PDF is now synonymous with its purpose – when someone needs to email their CV, fire off a contract draft, or pop a school assignment onto a USB drive and take it to the printers, they do it with a PDF. In its ubiquity, app developers have rushed to create the perfect fit for PDF documents on mobile devices, so you’ve got a fair selection to choose from. Kdan Mobile Software’s PDF Reader 6 Premium is one of the latest to hit the App Store, packing a solid feature set and attractive cloud-based connectivity suite to ensure its relevance in this ultra-connected age. 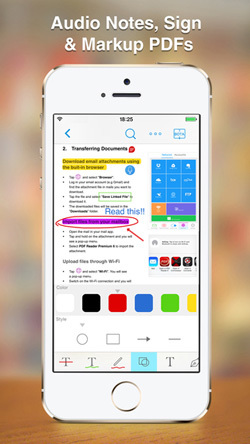 You might think that you can’t really get much wrong when creating a PDF reader app, but there are a surprising number of competing apps in this category which miss the mark completely. PDF Reader 6 covers all the basics with aplomb, but also includes a few extra features which make Kdan’s offering hard to ignore. Touch navigation is smooth throughout, even on the relatively small screen of an iPhone 5 – thankfully Cupertino gave us devices with stunning screens, so text is crisp and legible. Finding your way through a document; tagging text; highlighting important bits; throwing in a sticky note here and there; even quick freehand markings or drawings, it’s all handled through PDF Reader 6’s neatly implemented menu system, and it works. Your documents can be read out via Text-To-Speech, documents can be scanned via your device’s camera and then converted to PDF, pages can be added, deleted or rearranged; all in all, a rather comprehensive feature list. 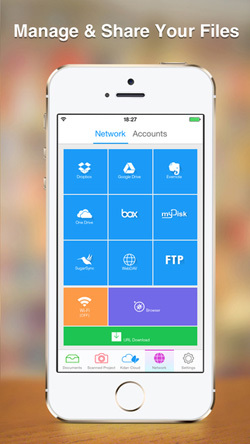 Kdan Mobile Software has also wisely included an abundance of connectivity options – Dropbox, Evernote, GoogleDrive and the rest of the usual suspects are fully integrated, along with Kdan’s own Kdan Cloud service (which gives you 500MB free upon sign-up). The document structure within the app is neat and intuitively structured, making it easy to manage your various PDF files, but it must be said that it’s not the most beautifully designed interface we’ve seen. 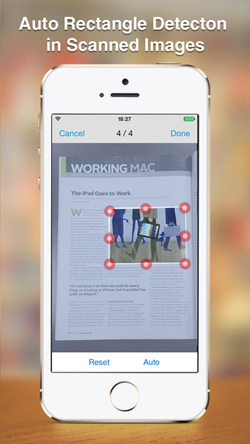 In the productivity arena, though, looks are outweighed by functionality, and PDF Reader 6 scores high in that regard. That’s not to say that it’s ugly – far from it – but it’s evident that the focus here is on business, not pleasure. Instead of flamboyance, you’re given a no-nonsense workspace which puts productivity first. This translates to a professionally crafted app, simple enough for the uninitiated who just want to read downloaded game manuals, complex enough for power users who want to dig into the annotation features and more. With its $1.99 cover price, PDF Reader 6 Premium offers good value for anyone who deals with PDF documents on a regular basis.